Fancy buying something different for Easter? It doesn't have to mean eggs. With so many special gifts this Easter, children can enjoy a treat. We got to review the amazing Lets Cook Chocolate Rotater. Raiden can make hes own 3D chocolate for hes family this Easter. Melt the chocolate in the special tub then Place chocolate into one of the moulds and then place it in the machine. Spin the mould for 3 minutes until the chocolate covers the mould and makes a hollow 3D shape. Then wrap it in colour foil and even add a tag to hang. Raiden loved making the chocolate moulds, i was surprised it kept him entertained for so long, such a simple idea has an amazing effect! They was rather yummy too! Kit comes with six ( lion, teddy, circle, egg, car, and shell) moulds, foil, string and a chocolate rotating machine. RRP is £14.99. There is a whole amazing range of Lets cool items. Fanastic if you have an eager cook in the house. 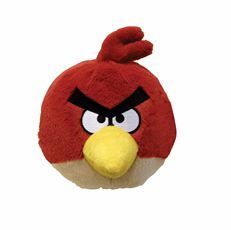 The Next item we got To test and review was an Angry birds cool plush with sound. 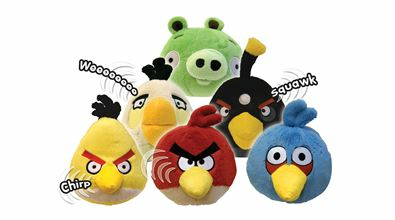 All of us are mad angry birds fans, we are a family that trys to beat each others scores when the others aren't looking. You can catapult your very own Angry Bird with these 4" Angry Birds Plush Toys with sound FX. When you press them its makes the flying sound them a smash there pretty cool! We got the red ( my favourtive) All the colour Birds and pig are available to buy at a mere £4.99 each. They also have keyrings and the plush toys in 5 inch and 8 inches too. Definitely a thumbs up if you have a crazy Angry birds fan! Raiden was that impressed hes taken it to school today to show he's friends.